Two of my toddler’s favorite shirts were Christmas presents last year from grandparents. The formerly two polka dot shirts, above, adorned my daughter in numerous photographs. It was to both of our dismay when they very recently became 3/4 length sleeve shirts due to her rapidly growing limbs. Seriously, it happened overnight. Santa brought new shoes thinking they would fit in the spring – nope, she is wearing them already! 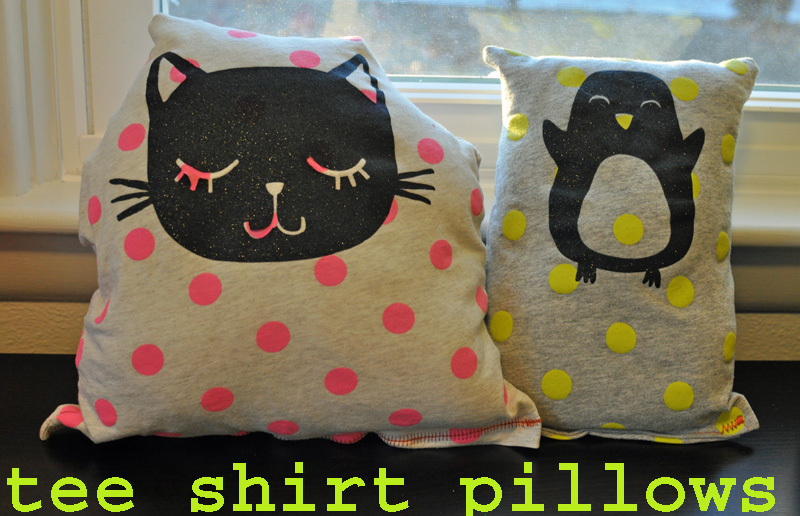 So, with the favorite shirts no longer in heavy rotation, I decided to immortalize them into pillows for her dolls or her bed. 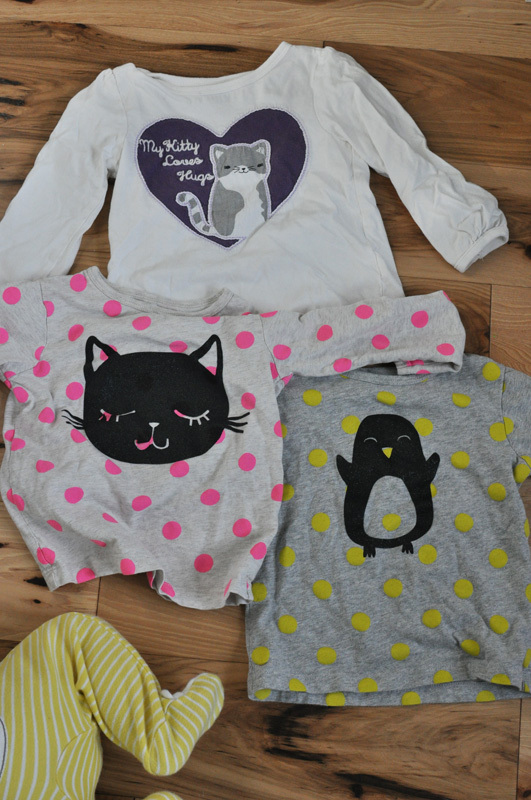 Originally, I was planning on repurposing three of her critter shirts. The top kitty shirt was spared because my sweet daughter said to me, “Thank you for the pillows, Mommy, but I was going to give the shirts to Dylan.” Dylan is her youngest cousin. I just about melted – I should have been smarter and asked her before cutting up these beloved shirts – of course she would want to share them! So, the My Kitty Loves Hugs shirt was pardoned from pillowization. (Sidenote: Please excuse my youngest’s leg cameo). 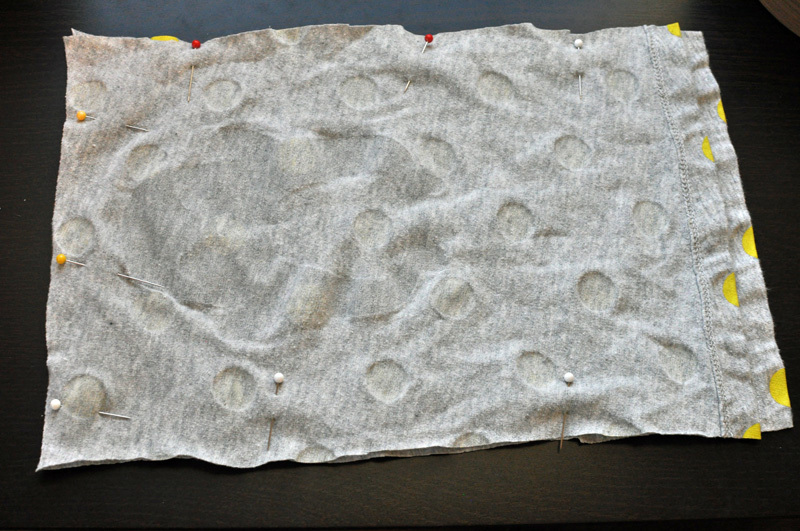 This was an easy sewing project that even children could complete themselves as an introduction to sewing. Knit fabric is forgiving and can take on interesting shapes. I was not interested in making perfectly geometric shapes, instead going for a more tilted stylized look. Next time I cut up old shirts they will be mine or I was ask permission first. Lesson learned! ← 6 months and a New Year!